If we accept that dragons are big and they hoard gold and gems (and don't make or mine these baubles, themselves), how do dragons physically manipulate and transport human/elf/dwarf-sized coins and jewels back to their lairs? Even if we assume considerable dexterity of dragons' front paws (namely an opposable 'thumb' claw), their paws are huge, compared to human hands. Unless they win all their loot in conveniently large treasure chests or sturdy bags, how can they grasp gems and coins, without their slipping between the dragon's huge talons? Small, more humanoid race that worship dragons and is what birds to an alligator - service force, tied with their dragon by complex mix of biological symbiotic relationships, religion, and deals. Some dragons may be able to shapeshift into humanoid form. This would help, right? Well, you know how birds feed their young? Just give your dragon a pocket before the stomach (like a bird’s crop) as a biological storage. If you're a dragon, why are you gathering coins one at a time? If I'm a dragon, the biggest baddest dude on Middle Earth or Faerun or wherever, I'm not going to pick-pocket people. I'm not robbing local barons, I'm going to knock over a king's palace and take the Peacock Throne and the Crown Jewels. 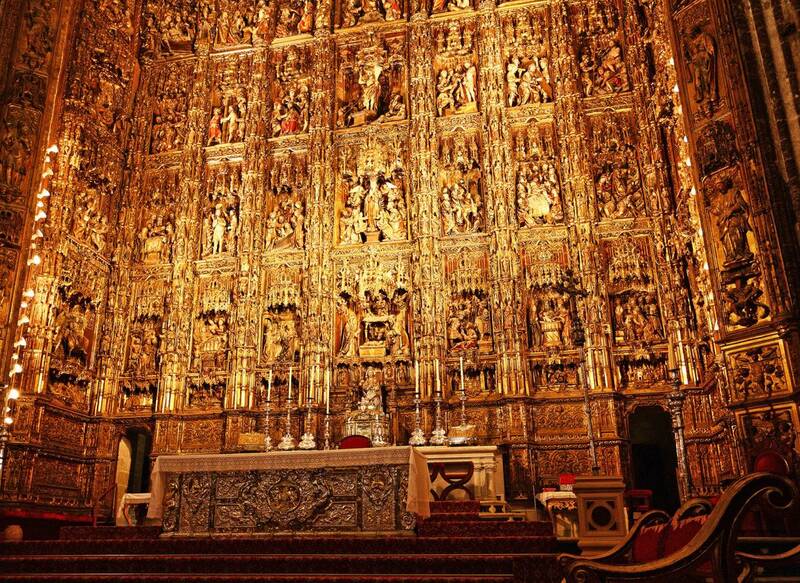 I'm not going after the loose change in the offering plate, I'm taking the whole 50 foot tall gold altar (from the Cathedral of Seville, fyi). Instead of hitting a tax collector, I'm going to rob the treasury at the point of delivery. All that money is going to be in nice convenient boxes or sacks. Snag a couple of those, and I'm on my way. Basically, I'm going to go after things that are pre-packaged and worth the most. They don't have to stay that way. I may have nabbed a few strongboxes from rich merchants, and if it suits my fancy I'll smash the sides in and let the coins spill out. It makes a more imposing visual effect for visiting hobbits. Maybe I decide to sit on the golden throne and discover it wasn't really made to support my weight? Oh well, I can just melt it down into a nice golden blob and use it as a pillow. Dragons have all the time in the world to put together their collection, and only the occasional pesky knight errant or black-arrowed archer to stop them. Dragons aren't going to waste their time on stuff that takes longer to carry home than it does to incinerate whoever was guarding it. Become a god, make your worshippers carry things for you. Dragons are clearly too important to do manual labor, let alone the menial transfer of wealth from one location to another. Step 1: Attack a city. Step 1A: Don't kill everyone. The same way that governments, kings, tyrants, and warlords gather their wealth: taxation. If the humans and other creatures in your domain don't bring you enough treasure, torch them. Maybe when they go raiding and pillaging, they go into bezerker mode, especially when they see a king and his noblemen, and he just gobbles them and anything around them up, like sharks do, Then expells the hard bits after digestion. This theory is all the more plausible because a full suit of armor was found inside a shark stomach! Dragons hoard gold for the same reason many birds collect shiny objects: to adorn their nests and attract mates. Unlike birds, though, dragons never stop growing, even after reaching maturity. A young adult dragon is only moderately bigger than a human. When they are first making their nests, they usually target individual, defenseless peddlers, killing them and taking their purses, which they carry in their claws or mouths. As they grow larger, they will begin attacking caravans which might be carrying large chests. Of course, dragons are highly territorial. Large dragons will often kill or drive out smaller dragons living nearby, then stealing gold from their hordes. Some devious dragons will intentionally allow smaller dragons to live in their territory for a while in order to collect more gold before taking it from them. Sometimes, dragons will live in family groups, with the young collecting gold for the family. Dragons with larger hoards will typically have more mates, and more children, allowing the size of their hoard to grow exponentially. Sometimes, a child may "inherit" a portion of the hoard when they leave the nest to build their own, although they will usually not take as much away as they put into it in the first place. Other times, especially in wealthy dragon families, dragons may spend a good part of their lives living in their family's lair; the huge size difference between older and younger dragons means that younger dragons are only able to mate with younger partners, preventing competition between generations. Larger dragons, naturally, will attract adventurous humans to their cave simply by virtue of living there. Whatever was in these adventurer's pockets at the time will naturally be added to the hoard. Most dragons have only a single hoard. However, extremely large dragons may migrate between lairs. When they are away, it is possible that a smaller dragon will attempt to take over their hoard, and will likewise end up adding to it. When the owner returns, whatever the smaller dragon collected will be added to the hoard. Some larger dragons will actually encourage this, seeing the additions as "payment" for use of their nest. Only the largest dragons will do this, as it otherwise carries the risk of a similarly-sized or larger dragon squatter that cannot be driven away so easily. Dragons who are feared by humans may increase their horde even further by allowing humans to live in their territory in exchange for occasional tributes of gold. By the time a dragon reaches legendary sizes, it is no longer collecting coins, instead targeting larger, more impressive fare like golden statues or the crowns of kings. However, an ancient dragon is still likely to have truly colossal piles of coins thanks to the accumulation of collection by children, squatters, adventurers, and tribute. Dragons haven't always been dragons. Think about it, when in a movie have you seen an actual dragon take loot? They pillage and breathe fire and burn stuff. But where did the dragon come from? You never see two of them in one area, so there can't be a mommy dragon and a daddy dragon making a family of new dragons. No, dragons were originally another kind of creature, one that walked on legs and had arms and hands that could carry stuff. That creature acquired lots of treasure, and as it did so its greed grew as did its fear of losing its treasure. So it hoarded it all away somewhere safe and over time the magical transformation began as it guarded its treasure in the dark, it morphed into a fearsome creature whose sole purpose was to keep its precious hoard from other, coming out only when provoked, or occasionally to seek sustenance. The gold is an illusion to lure in what the dragons really want: adventurers. Dragons don't need gold or treasure. That's just silly. Where would they spend it? The local DracoMarttm? Nope. Gold has no value to a dragon. It's just another shiny rock. Dragons need food. And lots of it. And flying around, snatching cattle and sheep from hillsides is tiring work. Much easier to make the food come to you. See, adventurers are high muscle, low fat. They are often fortified with fiber (scrolls, wooden weapon parts, clothes) and iron (weapons, armor). Very tasty and nutritious! Sure, they have to travel out and scare the locals from time to time. You know, to drum up business. But as long as the adventurers keep coming, the dragon has to expend far less effort to stay well-fed. They're the snack that fights back. Dragons aren't hoarders. They are spiders whose web is made of illusory treasure to lure you in. Eventually, there would be real treasure. Some as coinage / loot dropped by adventurers as the dragon feasts. Some coughed up as pellets after the dragon has feasted. But the initial hoard is fake. On Kibota, the world of one of my novels, dragons work in close partnership with humans. When the industrial revolution hit that world, the dragons developed a fondness for trains. Kids love model trains, and to massive dragons, our full-sized trains are like toy train sets. Believe me, you want to have dragons patrolling your lines, otherwise the herds of dinosaurs will cause massive derailments. Most people don't know this but a dragon's mouth works like a pelican's beak. It has a pouch which expands to hold things. I never believed them to find treasure and take it back to their den. Dragons are attracted to treasure, so they go to where other people/creatures have gathered a lot and take over. What type of dragons are we talking about? A lot of myths and fantasy have dragons being able to assume a human shape. If that's not possible in this situation, then it's easy for them to force others to do their bidding. Most people would do whatever needed to be done to survive. Not all the coins are coins; some are scales. Part of the reason dragons pick up coins to begin with is to make them look older, more established, more distinguished (very important for establishing prior claim if your dragons are territorial). But that's why, you wanted how. And for that, well, it'll depend on the dragon: for instance, some will simply grab whatever they can in their talons, and the trail of dropped coins will likely lead a steady stream of adventurers in pursuit (the first one presumably retrieving the coins as they go), providing a delightful residual income of snacks and treasure. Of course, such dragons do have to take care not to attract too many such streams, lest the visitors arrive while the host is out, or worse, scratch a wing. Most dragons are known to swallow and regurgitate their loot. Many have magic to extradimensionally expand their gullets for just this purpose. Not the answer you're looking for? Browse other questions tagged magic creature-design mythical-creatures dragons or ask your own question. Would dragons cook their food?